Review | When a child says something witty, it is cute. An artist who gives a new view on matters is refreshing. A scientist who develops a new theory might improve the world. Yet, a car buyer who depends on a vehicle daily, will choose prooven technology. This is why the new Toyota Yaris is no longer an odd ball, but goes mainstream instead. Does the new Yaris still manage to distinguish itself from the mass? The first two generations of the Yaris were perky little cars that won the hearts of customers just by their looks. The new Yaris is no more than a small Toyota. That isn't meant as a criticism, because new Toyotas have a modern and recognisable appearance. On the other hand: the new Yaris doesn't look remarkable in any way. Step behind the wheel and it quickly becomes clear how the Yaris distinguishes itself from its main rivals. Outspoken design and clever ergonomics have been replaced by luxury that was only available in cars from a higher segment until now. 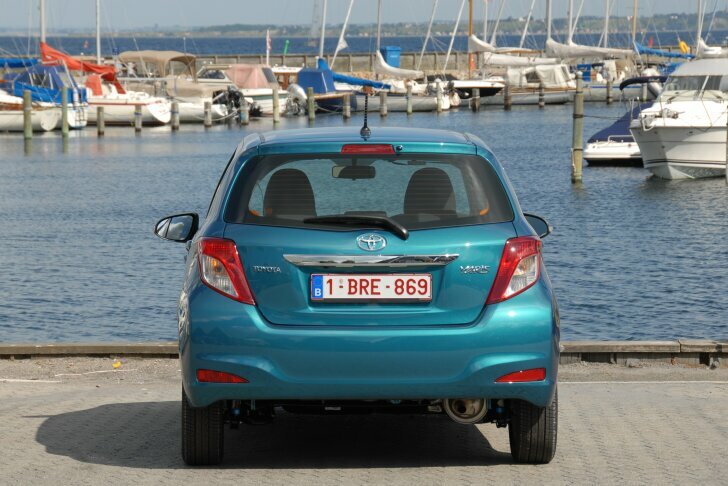 For example, the Yaris can be fitted with dual zone air conditioning, a rear-view camera and a high grade audio system. Although the standard radio/CD player already has an above average sound quality for a car in this price range, the optional high grade system even sounds good compared to any other car! "Touch & Go" is the name of Toyota's new system that features both audio and satnav. The satnav can use Google as a source of addresses. Users can install their own apps which, for example, locate the cheapest petrol station in the vicinity or find parking with a certain number of free spots. Regrettably the screen is hardly readable because of reflections, which strongly affects usability. The new Yaris is 10 cm longer than the previous generation. According to the designers they decided to do this because a longer car has a more elegant silhouette. Also, a longer wheelbase makes the car more stable. The most important argument is customer demand for more cabin space. The ten extra centimetres mainly benefit the room in the back. Even with a tall driver in the front, there's still ample space remaining in the rear. The front seats are big and offer plenty of side support. This is why the driver doesn't feel like they are sitting on top of the car, but inside it. However, the seats tilt when lowering them, making the driver rest his/her weight less on the legs and more on the lower back. The boot is also much larger than before. On top of that the Yaris has a variable loading floor. Depending on the situation, the driver can choose maximum space (347 litres), but baggage has to be lifted over a rather high threshold. Alternatively, the loading floor can be raised to get rid of that threshold, thereby slightly decreasing the boot space. The back seat can easily be folded up (no need to remove headrests!) to accommodate even more luggage. Even before driving a single yard, the Yaris feels good thanks to the small, leather upholstered steering wheel. Once on the way, the Yaris handles like a grown-up large car and not like a cheeky city car. Comfort on bad road surfaces is fine, while the Yaris isn't afraid of cornering either. The more sporty models are fitted with 16 inch rims, which benefit both handling and the communication with the driver. The brakes are powerful and ensure a short braking distance. When one does overestimate oneself, VSC (Vehicle Stability Control) and traction control come to the rescue. When even that doesn't help, the Yaris deploys no less than seven airbags (including a knee airbag). For now, the Yaris is available with a 1.0 and 1.3 litre petrol engine. With the lightest engine of the two under the bonnet, the new Yaris is as frugal as ever before. The 69 PS / 93 Nm strong three-cylinder engine performs adequately in city traffic, but struggles when accelerating to highway speeds. If it is up to the gear shift indicator, all speeds above 30 mph are done in fifth gear. To accelerate quickly from 50 to 75 mph it doesn't suffice to shift down from fifth to fourth gear, third gear has to be engaged. Toyota promises an average fuel consumption of 4.8 litres per 100 km (59 mpg) and that can actually be done with a calm driving style. Because there was a lot of city traffic on the test route (which wasn't compensated for by a stop/start system) the test drive cost 5.2 litres per 100 km (54 mpg). 1.3 Multidrive-S: go for it! As an alternative to the 1.0 litre three-cylinder, a 1.3 litre four-cylinder engine is available. It offers everything the smaller engine lacks in both performance and refinement. Logically, this comes at a price. A test drive over a similar route as with the 1.0 litre vehicle cost 5.9 litres per 100 km (48 mpg). Especially in combination with the optional CVT gearbox, the Yaris "Multidrive S" is remarkably comfortable for a compact car. 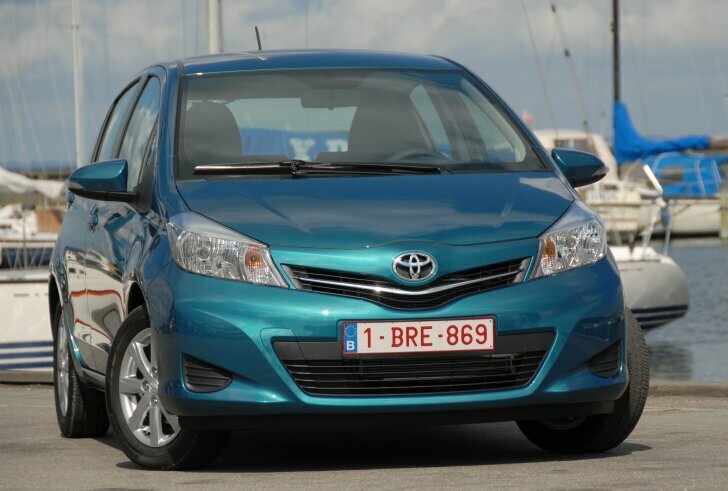 Despite other CVT gearboxes, the Yaris doesn't whine or delay when pressing the pedal to the metal. The driver can shift manually using levers behind the steering wheel. During the test drive this was hardly ever necessary. Because the computer does such a good job, the driver never feels like interfering. The only time the manual control does come in handy is when going downhill, so engine braking can be applied. The 1.4 litre diesel engine offers by far the best combination of performance and fuel economy. Despite hasty driving and lots of city traffic, the trip computer noted a modest 5.4 litres per 100 km (52 mpg). The optional "MultiMode" automatic gearbox isn't recommendable: it shifts so slowly that it causes more annoyance than comfort. For even better fuel economy, a hybrid Yaris is expected mid 2012. According to Toyota it will be so frugal that, at least from a technical point of view, the new Yaris is as outstanding as before. 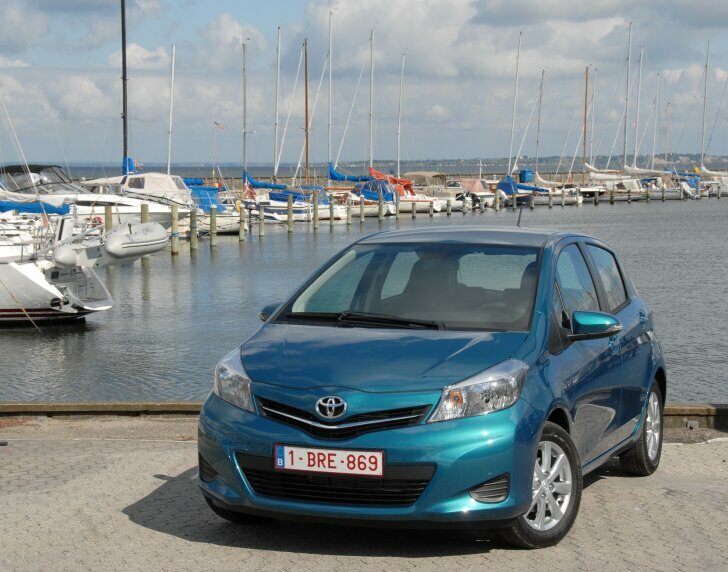 The Yaris is Toyota's most popular model in Europe. To prolong that success the all-new Yaris will arrive at the local dealers in September. Compared to the first two generations, this third Yaris is more mainstream. The new Yaris is aimed at customers who want to downsize without compromising on luxury or safety. The top model, particularly, offers so much comfort that only the size remains modest. 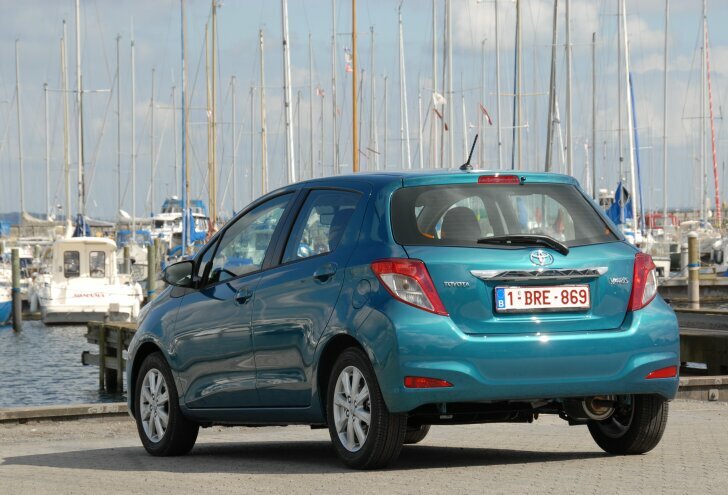 The Yaris also aims at customers who do not choose by looks or image, but by pure rationality. 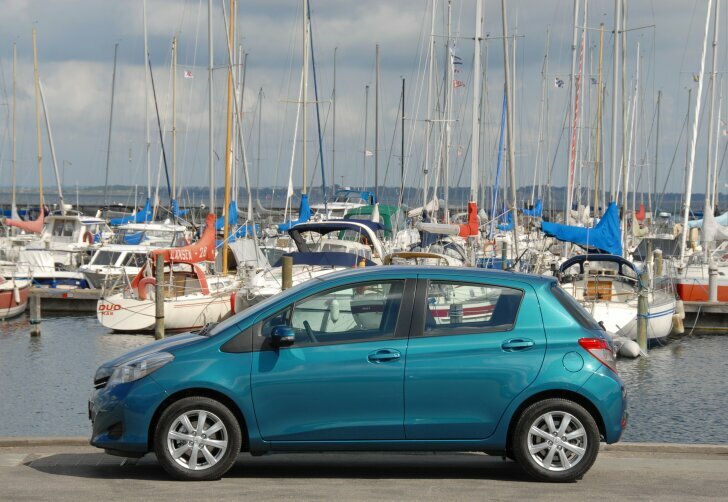 Despite its compact size, the Yaris offers lots of cabin space. All engines are frugal. The 1.0 litre petrol engine performs no more than adequately, while the 1.3 litre does well and the 1.4 litre diesel is downright spritely. No matter what trim level, safety levels are high. This may not make the new Yaris original or innovative, but it is exactly what the customer is looking for.